A Team member, out for a walk with her dogs, came across a lady who had been walking with her partner. She had slipped on muddy grass, and suffered an ankle injury. The Team member raised the alarm, and the Team set off to Braithwaite with two vehicles full of personnel. 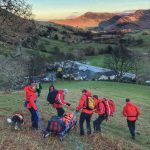 The lady was treated at the scene, and then stretchered down to Braithwaite Lodge, where she was transferred to an NWAS ambulance for transport to Whitehaven Hospital.